TRENTON, N.J. Men who are bashful about needing help in the bedroom no longer have to go to the drugstore to buy that little blue pill. In a first for the drug industry, Pfizer Inc. told The Associated Press that the drugmaker will begin selling its popular erectile dysfunction pill Viagra directly to patients on its website. Men still will need a prescription to buy the blue, diamond-shaped pill on viagra.com, but they no longer have to face a pharmacist to get it filled. And for those who are bothered by Viagra's steep $25-a-pill price, Pfizer is offering three free pills with the first order and 30 percent off the second one. Pfizer's bold move blows up the drug industry's distribution model. Drugmakers don't sell medicines directly to patients. Instead, they sell in bulk to wholesalers, who then distribute the drugs to pharmacies, hospitals and doctors' offices. But the world's second-largest drugmaker is trying a new strategy to tackle a problem that plagues the industry. Unscrupulous online pharmacies increasingly offer patients counterfeit versions of Viagra and other brand-name drugs for up to 95 percent off with no prescription needed. Patients don't realize the drugs are fake or that legitimate pharmacies require a prescription. Other major drugmakers likely will watch Pfizer's move closely. If it works, drugmakers could begin selling other medicines that are rampantly counterfeited and sold online, particularly treatments for non-urgent conditions seen as embarrassing. Think: diet drugs, medicines for baldness and birth control pills. "If it works, everybody will hop on the train," says Les Funtleyder, a health care strategist at private equity fund Poliwogg, who believes Pfizer's site will attract "fence-sitters" who are nervous about buying online. The online Viagra sales are Pfizer's latest effort to combat a problem that has grown with the popularity of the Internet. In recent years, Americans have become more comfortable with online shopping, with many even buying prescription drugs online. That's particularly true for those who don't have insurance, are bargain hunters or want to keep their medicine purchases private. Few realize that the vast majority of online pharmacies don't follow the rules. The Internet is filled with illegitimate websites that lure customers with spam emails and professional-looking websites that run 24-hour call centers. A January study by the National Association of Boards of Pharmacy, which accredits online pharmacies, found that only 257 of 10,275 online pharmacy sites it examined appeared legitimate. Experts say the fake drugs such websites sell can be dangerous. That's because they don't include the right amount of the active ingredient, if any, or contain toxic substances such as heavy metals, lead paint and printer ink. They're generally made in filthy warehouses and garages in Asia, Eastern Europe and Latin America. Online buyers are "playing Russian roulette," says Matthew Bassiur, vice president of global security at New York-based Pfizer. "The factories are deplorable. I've seen photographs of these places," he says. "You wouldn't even want to walk in them, let alone ingest anything made in them." Pfizer, which invented the term "erectile dysfunction," has long been aggressive in fighting counterfeiters. It conducts undercover investigations and works with authorities around the globe, with good reason. Counterfeit versions of Viagra and dozens of other Pfizer medicines rob the company of billions in annual sales. Viagra is one of its top drugs, with $2 billion in worldwide revenue last year. And it's the most counterfeited drug in the U.S., according to the company. A 2011 study, in which Pfizer bought "Viagra" from 22 popular Internet pharmacies and tested the pills, found 77 percent were counterfeit. Most had half or less of the promised level of the active ingredient. Viagra is appealing to counterfeiters because it carries a double whammy: It's expensive and it treats a condition with an "embarrassment" factor. Crooks running the illegal online pharmacies brazenly explain their ultra-low Viagra prices -- often $1 to $3 a pill -- by claiming they sell generic Viagra. Generics are copycat versions of brand-name prescription drugs. They can legally be made after a drugmaker's patent, or exclusive right to sell a drug, ends. Generic drugmakers don't have to spend $1 billion or so on testing to get a new drug approved, so their copycat versions often cost up to 90 percent less than the original drug. But there is no such thing as generic Viagra. Pfizer has patents giving it the exclusive right to sell Viagra until 2020 in the U.S. and for many years in other countries. Many patients are unaware of that. Dr. David Dershewitz, an assistant urology professor at New Jersey Medical School who treats patients at Newark's University Hospital, says erectile dysfunction is common in men with enlarged prostates, diabetes and other conditions, but most men are too embarrassed to discuss it. He says well over half of his patients who do broach the issue complain about Viagra's price. Some tell Dershewitz that they go online looking for bargains because they can't afford Viagra. "The few that do admit to it have said that the results have been fairly dismal," but none has suffered serious harm, he says. For Pfizer, that's a big problem. People who buy fake drugs online that don't work, or worse, harm them, may blame the company's product. That's because it's virtually impossible to distinguish fakes from real Viagra. "The vast majority of patients do believe that they're getting Viagra," said Vic Cavelli, head of marketing for primary care medicines at Pfizer, which plans to have drugstore chain CVS Caremark Corp. fill the orders placed on viagra.com. 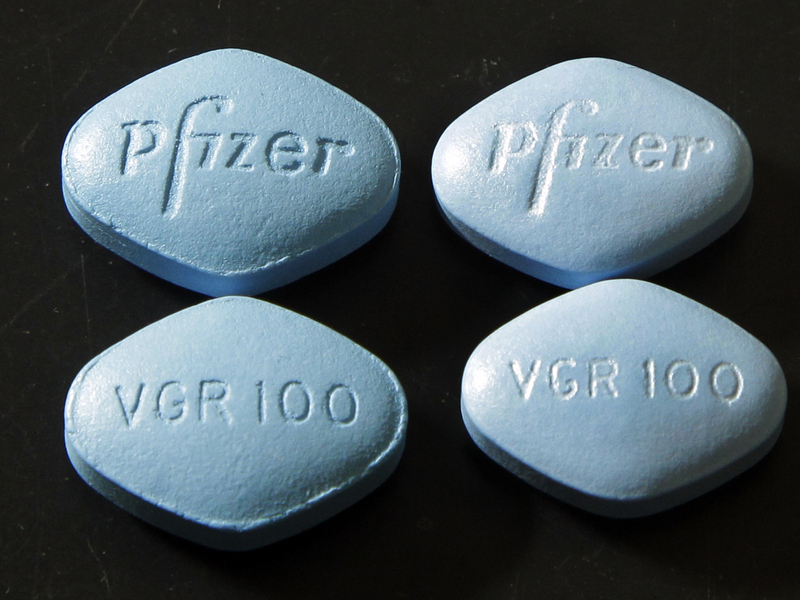 The sales lost to counterfeits threaten Pfizer at a time when Viagra's share of the $5 billion-a-year global market for legitimate erectile dysfunction drugs has slipped, falling from 46 percent in 2007 to 39 percent last year, according to health data firm IMS Health. The reason? Competition from rival products, mainly Eli Lilly and Co.'s Cialis -- the pill touted in those ubiquitous commercials featuring couples in his-and-hers bathtubs in bizarre places. Judson Clark, an Edward Jones analyst, forecasts that Viagra sales will decline even further, about 5 percent each year for the next five years, unusual "for a drug in its prime." Clark says he thinks Pfizer's strategy will prevent sales from declining, but he's unsure how well it will work. "It's a very interesting and novel approach," he says. "Whether it returns Viagra to growth is hard to say."